Apple's new iPhone 5c isn't for everyone and doesn't really offer anything new aside from iOS 7. However, it remains a worthy upgrade for anyone with an iPhone 4 or iPhone 4S, or more importantly for Apple, anyone currently without an iPhone. Apple's colourful iPhone 5c represents a new direction in strategy for the company's iPhone line and it's all about marketing. Where the arrival of a new iPhone previously resulted in selling last year's model at a lower price, the iPhone 5c is 2013's iPhone 5. It uses largely the same internals as that model, but comes wrapped in a plastic case in five bright, attractive colours. The 5c isn't for everyone and doesn't really offer anything new aside from iOS 7. However, it remains a worthy upgrade for anyone with an iPhone 4 or iPhone 4S, or more importantly for Apple, anyone currently without an iPhone. "Beautifully, unapologetically plastic". That's Apple's tagline for the iPhone 5c, and a perfect example that this phone is all about marketing. Available in white, red, blue, yellow and green colour variants, the iPhone 5c is constructed from hard-coated polycarbonate. It's a little heavier than last year's iPhone 5 (132g), but otherwise is much the same — the 5c retains a similar shape to the iPhone 5 and its ports and buttons are in the usual places. The new colour options are vibrant and attractive, though the red variant appears to be more of a pink tone, and the white model doesn't stand out as much as the rest. The iPhone 5c feels better constructed than many flagship smartphones. 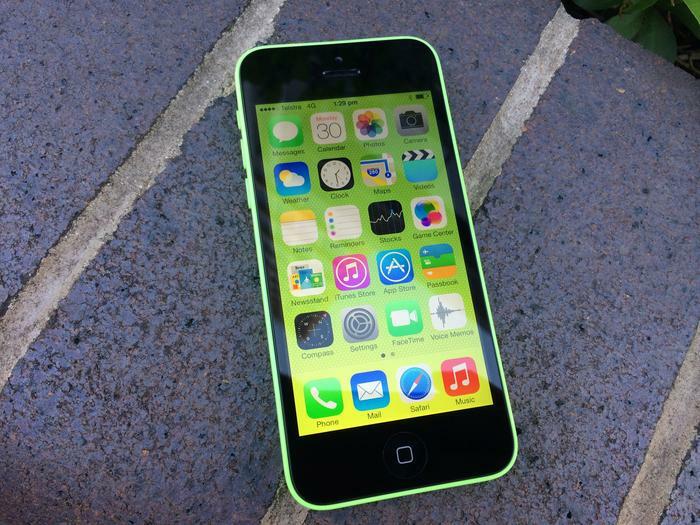 The iPhone 5c may be made from plastic, but it feels nothing like a cheap smartphone. The glossy finish is a little slippery to hold and does attract plenty of fingerprints, but the case feels sturdy. The fact that there's no visible seams, part lines or joins is also nice touch. Although we would have preferred a matte finish, similar to what Nokia uses on many of its colourful Lumia smartphones, the iPhone 5c feels better constructed than many flagship smartphones on the market, particularly the Samsung Galaxy S4. 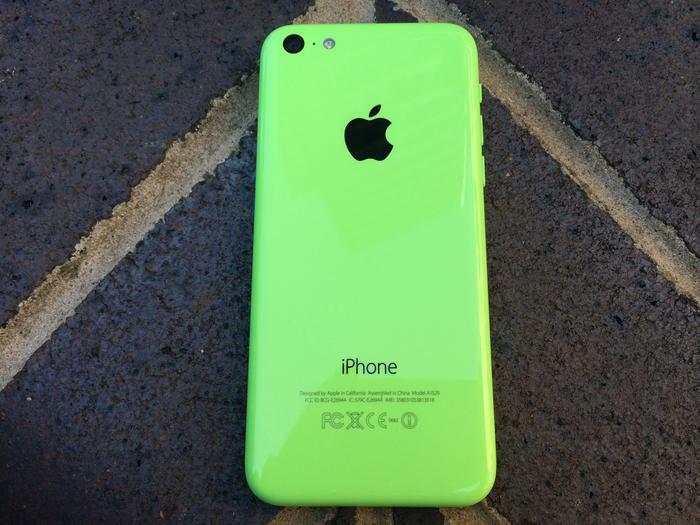 The top-mounted power/lock button and the volume buttons on the left provide excellent tactility and are perfectly positioned, but the iPhone 5c's glossy finish is prone to wear and tear. After a week of use, our green review unit picked up plenty of scratches and marks, particularly on the back. While these were only visible if you look hard for them, you're probably going to want to keep the iPhone 5c in a case. Perhaps that's why Apple sells its own custom case for the iPhone 5c, made from soft-feeling silicone. The cases, priced at AU$39 each, come in a different range of colours from the iPhone 5c (blue, green, pink, yellow, black and white) and have circular cut-out patterns on the back so you can see the colours of the phone underneath. It's an odd look, but one that you'll eventually get used to. The grippy finish of the case is a nice contrast to the glossy finish of the iPhone 5c. The only significant change is the front-facing camera. The iPhone 5c is virtually identical to the current iPhone 5 internally. It has the same 4in Retina display, uses the same A6 processor, and comes with the same 8-megapixel rear camera. The only significant change is the front-facing camera, which has larger pixels and now includes backside illumination. The upgraded front-camera results in better quality selfies should you be so inclined, and also improves the quality of outgoing video calls, particularly on Facetime. These improvements to the camera are a welcome addition but are not a significant upgrade. Unfortunately, the iPhone 5c misses out on two of the iPhone 5s' best camera features, an excellent burst mode and slo-mo video recording. Apple says that the iPhone 5c has a slightly larger internal battery than the iPhone 5. In our battery test, we found it usually lasted a full day, but heavy users will still have to reach for the charger before the end of the day. Less frequent users shouldn't have too many issues as the iPhone 5c is fairly efficient in standby mode. It's a significant improvement over iOS 6. The real upgrade on the iPhone 5c is the newest version of Apple's mobile operating system, iOS 7. New features include a completely revamped user interface, AirDrop wireless sharing, and an all-new Control Centre. We also love how Apple pre-loads the iPhone 5c with wallpapers to match the colour variant you choose — for example, a green model comes pre-loaded with green coloured wallpaper. It's a basic touch but one that's typically Apple. iOS 7 will be available as a software update for all other iOS products, so it's not exactly unique to the iPhone 5c. It has received mixed reviews but we think it's a significant and welcome upgrade overall. The bright colours and light menus do take some getting used to, and some of Apple's icons are just strange. Overall, though, it's a significant improvement over iOS 6, which looked dated compared to its Android and Windows Phone competitors. The control centre is the most useful new feature. iOS 7 certainly isn't perfect. Notifications remain significantly inferior to Android, the default calendar app is limited and Siri is improved, but remains less useful than it should be. There's plenty of improvements on the whole, however, and most users should be left pretty satisfied, particularly for first time iPhone users. Should you buy the iPhone 5c? If you're a current iPhone 4 or 4S user, if you've invested heavily in the Apple iOS ecosystem and if you're happy with the way the iPhone works, you'll more than likely be very pleased with the iPhone 5c. 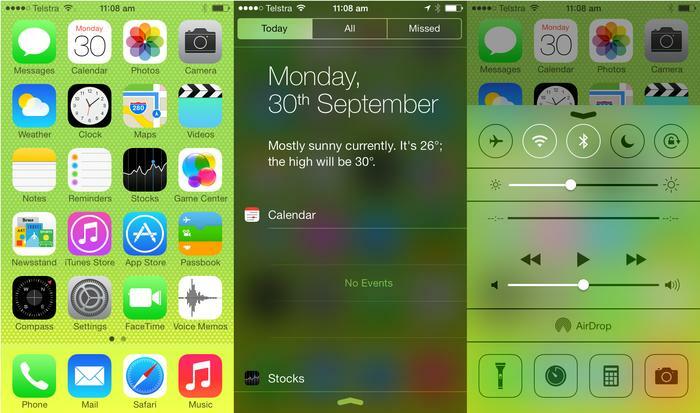 The new colour options are vibrant and attractive, and iOS 7 is a nice upgrade from Apple's previous software. If you're not a current iPhone owner, and you're looking for a smartphone, the choice is more difficult. If you want a larger screened device and more flexibility, an Android phone is probably a better choice for you, and if you want a truly great camera with more features, then Nokia's Lumia 1020 and Sony's Xperia Z1 are definitely worth a look. And given the minimal price difference between the iPhone 5c and the flagship iPhone 5s, you may be better off with the latter. The Apple iPhone 5c is available now in Australia through Telstra, Optus, Vodafone and Virgin Mobile. The iPhone 5c will also be sold outright through Apple's Retail Stores, and through the Apple online store with Australian pricing set at AU$739 for the 16GB model and $869 for the 32GB model. The iPhone 5c will be available through Telecom and Vodafone in New Zealand. It will be sold outright via Apple's website, at an RRP of NZ$899 for the 16GB version, $1,049 for 32GB.